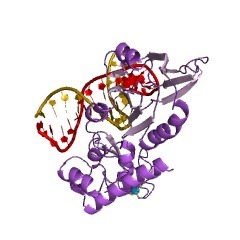 This entry represents the catalytic domain of DNA glycosylase/AP lyase enzymes, which are involved in base excision repair of DNA damaged by oxidation or by mutagenic agents. 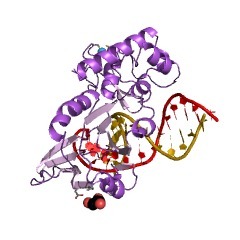 Most damage to bases in DNA is repaired by the base excision repair pathway (PUBMED:15588838). 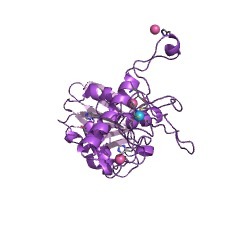 These enzymes are primarily from bacteria, and have both DNA glycosylase activity and AP lyase activity. 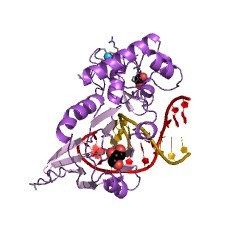 Examples include formamidopyrimidine-DNA glycosylases (Fpg; MutM) and endonuclease VIII (Nei). 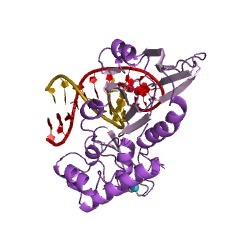 Formamidopyrimidine-DNA glycosylases (Fpg, MutM) is a trifunctional DNA base excision repair enzyme that removes a wide range of oxidation-damaged bases (N-glycosylase activity; ) and cleaves both the 3'- and 5'-phosphodiester bonds of the resulting apurinic/apyrimidinic site (AP lyase activity; ). 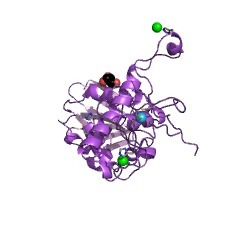 Fpg has a preference for oxidised purines, excising oxidized purine bases such as 7,8-dihydro-8-oxoguanine (8-oxoG). 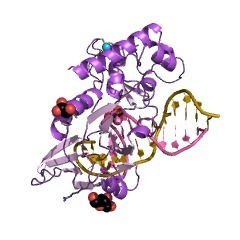 ITs AP (apurinic/apyrimidinic) lyase activity introduces nicks in the DNA strand, cleaving the DNA backbone by beta-delta elimination to generate a single-strand break at the site of the removed base with both 3'- and 5'-phosphates. Fpg is a monomer composed of 2 domains connected by a flexible hinge (PUBMED:10921868). 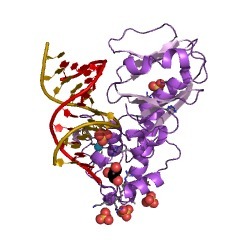 The two DNA-binding motifs (a zinc finger and the helix-two-turns-helix motifs) suggest that the oxidized base is flipped out from double-stranded DNA in the binding mode and excised by a catalytic mechanism similar to that of bifunctional base excision repair enzymes (PUBMED:10921868). Fpg binds one ion of zinc at the C-terminus, which contains four conserved and essential cysteines (PUBMED:8473347), (PUBMED:7704272). 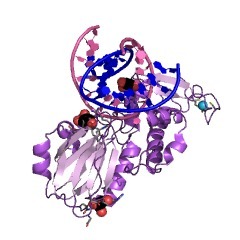 Endonuclease VIII (Nei) has the same enzyme activities as Fpg above, but with a preference for oxidized pyrimidines, such as thymine glycol, 5,6-dihydrouracil and 5,6-dihydrothymine (PUBMED:15232006). 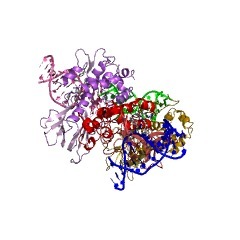 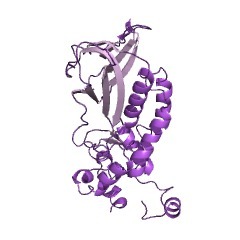 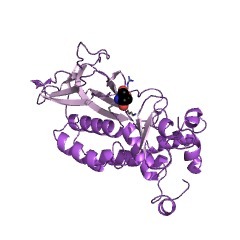 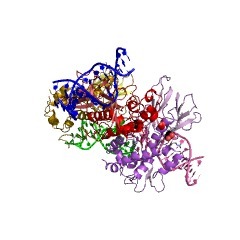 These protein contains three structural domains: an N-terminal catalytic core domain, a central helix-two turn-helix (H2TH) module and a C-terminal zinc finger (see PDB:1K82) (PUBMED:11912217). The N-terminal catalytic domain and the C-terminal zinc finger straddle the DNA with the long axis of the protein oriented roughly orthogonal to the helical axis of the DNA. Residues that contact DNA are located in the catalytic domain and in a beta-hairpin loop formed by the zinc finger (PUBMED:12055620). This entry represents the catalytic domain of DNA glycosylase/AP lyase enzymes, which are involved in base excision repair of DNA damaged by oxidation or by mutagenic agents. 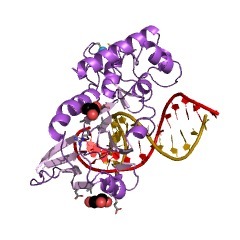 Most damage to bases in DNA is repaired by the base excision repair pathway [(PUBMED:15588838)]. 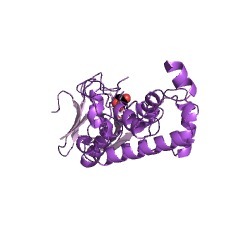 These enzymes are primarily from bacteria, and have both DNA glycosylase activity (EC 3.2.2) and AP lyase activity (EC 4.2.99.18). 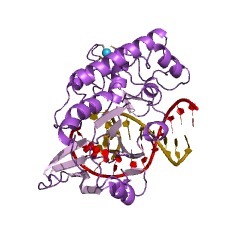 Examples include formamidopyrimidine-DNA glycosylases (Fpg; MutM) and endonuclease VIII (Nei). Formamidopyrimidine-DNA glycosylases (Fpg, MutM) is a trifunctional DNA base excision repair enzyme that removes a wide range of oxidation-damaged bases (N-glycosylase activity; EC 3.2.2.23) and cleaves both the 3'- and 5'-phosphodiester bonds of the resulting apurinic/apyrimidinic site (AP lyase activity; EC 4.2.99.18). 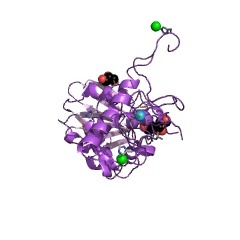 Fpg has a preference for oxidised purines, excising oxidized purine bases such as 7,8-dihydro-8-oxoguanine (8-oxoG). ITs AP (apurinic/apyrimidinic) lyase activity introduces nicks in the DNA strand, cleaving the DNA backbone by beta-delta elimination to generate a single-strand break at the site of the removed base with both 3'- and 5'-phosphates. 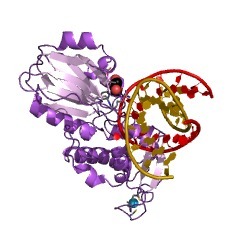 Fpg is a monomer composed of 2 domains connected by a flexible hinge [(PUBMED:10921868)]. The two DNA-binding motifs (a zinc finger and the helix-two-turns-helix motifs) suggest that the oxidized base is flipped out from double-stranded DNA in the binding mode and excised by a catalytic mechanism similar to that of bifunctional base excision repair enzymes [(PUBMED:10921868)]. 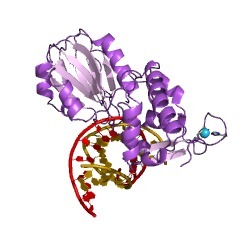 Fpg binds one ion of zinc at the C terminus, which contains four conserved and essential cysteines [(PUBMED:8473347), (PUBMED:7704272)]. 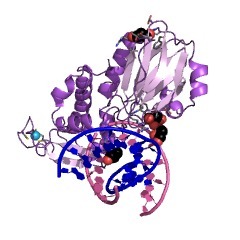 Endonuclease VIII (Nei) has the same enzyme activities as Fpg above (EC 3.2.2, EC 4.2.99.18), but with a preference for oxidized pyrimidines, such as thymine glycol, 5,6-dihydrouracil and 5,6-dihydrothymine [(PUBMED:15232006)]. These protein contains three structural domains: an N-terminal catalytic core domain, a central helix-two turn-helix (H2TH) module and a C-terminal zinc finger [(PUBMED:11912217)]. 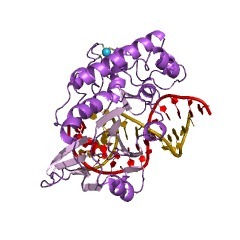 The N-terminal catalytic domain and the C-terminal zinc finger straddle the DNA with the long axis of the protein oriented roughly orthogonal to the helical axis of the DNA. 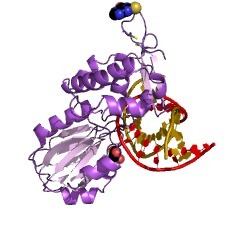 Residues that contact DNA are located in the catalytic domain and in a beta-hairpin loop formed by the zinc finger [(PUBMED:12055620)]. 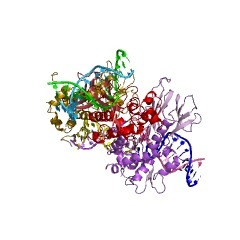 There are 28602 Fapy_DNA_glyco domains in 28602 proteins in SMART's nrdb database. 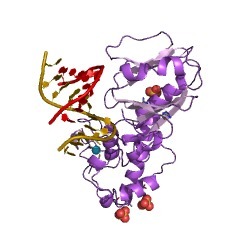 Taxonomic distribution of proteins containing Fapy_DNA_glyco domain. This tree includes only several representative species. 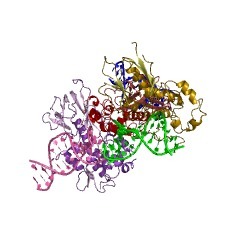 The complete taxonomic breakdown of all proteins with Fapy_DNA_glyco domain is also avaliable. 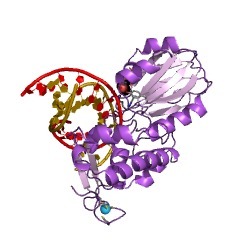 Click on the protein counts, or double click on taxonomic names to display all proteins containing Fapy_DNA_glyco domain in the selected taxonomic class. 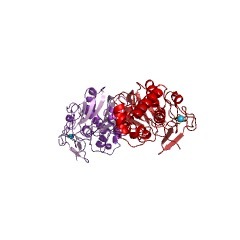 The crystal structure of human endonuclease VIII-like 1 (NEIL1) reveals azincless finger motif required for glycosylase activity. In prokaryotes, two DNA glycosylases recognize and excise oxidizedpyrimidines: endonuclease III (Nth) and endonuclease VIII (Nei). 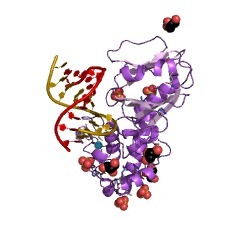 Theoxidized purine 8-oxoguanine, on the other hand, is recognized by Fpg(also known as MutM), a glycosylase that belongs to the same family asNei. 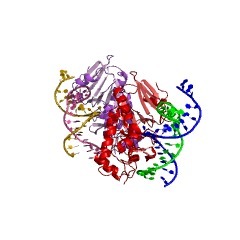 The recent availability of the human genome sequence allowed theidentification of three human homologs of Escherichia coli Nei. 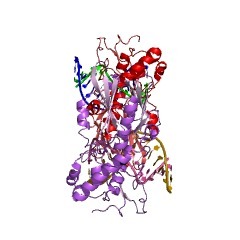 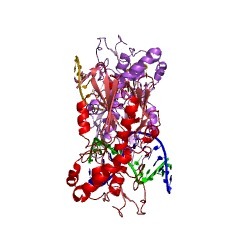 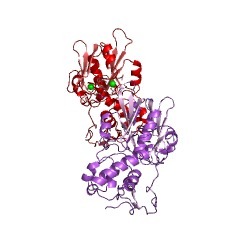 We reporthere the crystal structure of a human Nei-like (NEIL) enzyme, NEIL1. 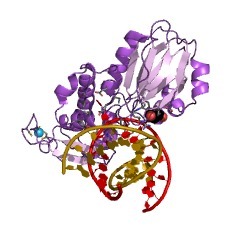 Thestructure of NEIL1 exhibits the same overall fold as E. coli Nei, albeitwith an unexpected twist. Sequence alignments had predicted that NEIL1would lack a zinc finger, and it was therefore expected to use a differentDNA-binding motif instead. 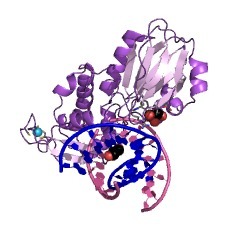 Our structure revealed that, to the contrary,NEIL1 contains a structural motif composed of two antiparallelbeta-strands that mimics the antiparallel beta-hairpin zinc finger foundin other Fpg/Nei family members but lacks the loops that harbor thezinc-binding residues and, therefore, does not coordinate zinc. 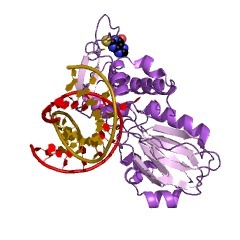 This"zincless finger" appears to be required for NEIL1 activity, becausemutating a very highly conserved arginine within this motif greatlyreduces the glycosylase activity of the enzyme. 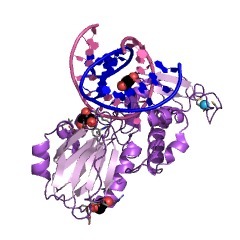 Structural insights into lesion recognition and repair by the bacterial8-oxoguanine DNA glycosylase MutM. MutM is a bacterial 8-oxoguanine glycosylase responsible for initiatingbase-excision repair of oxidized guanine residues in DNA. Here we reportfive different crystal structures of MutM-DNA complexes that representdifferent steps of the repair reaction cascade catalyzed by the proteinand also differ in the identity of the base opposite the lesion (the'estranged' base). These structures reveal that the MutM active siteperforms the multiple steps of base-excision and 3' and 5' nicking withminimal rearrangement of the DNA backbone. 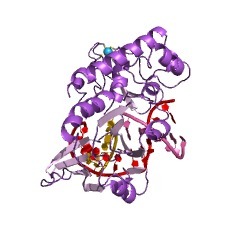 Structure of formamidopyrimidine-DNA glycosylase covalently complexed toDNA. 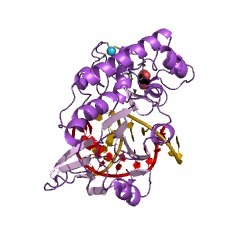 Formamidopyrimidine-DNA glycosylase (Fpg) is a DNA repair enzyme thatexcises oxidized purines from damaged DNA. 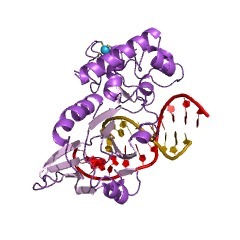 The Schiff base intermediateformed during this reaction between Escherichia coli Fpg and DNA wastrapped by reduction with sodium borohydride, and the structure of theresulting covalently cross-linked complex was determined at a 2.1-Aresolution. 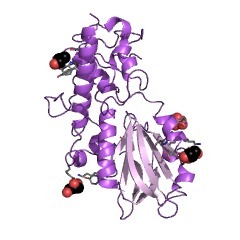 Fpg is a bilobal protein with a wide, positively chargedDNA-binding groove. It possesses a conserved zinc finger and a helix-twoturn-helix motif that participate in DNA binding. The absolutely conservedresidues Lys-56, His-70, Asn-168, and Arg-258 form hydrogen bonds to thephosphodiester backbone of DNA, which is sharply kinked at the lesionsite. Residues Met-73, Arg-109, and Phe-110 are inserted into the DNAhelix, filling the void created by nucleotide eversion. 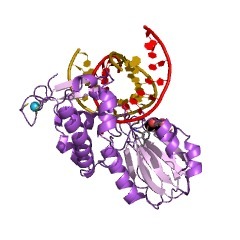 A deep hydrophobicpocket in the active site is positioned to accommodate an everted base.Structural analysis of the Fpg-DNA complex reveals essential features ofdamage recognition and the catalytic mechanism of Fpg. 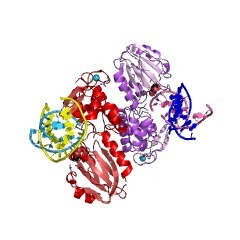 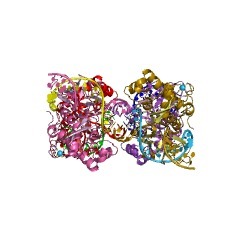 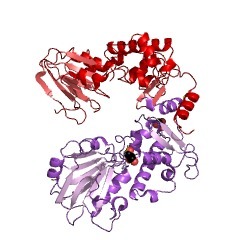 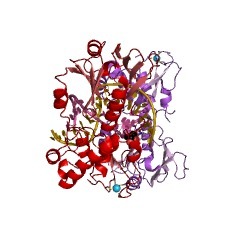 Crystal structure of a repair enzyme of oxidatively damaged DNA, MutM(Fpg), from an extreme thermophile, Thermus thermophilus HB8. 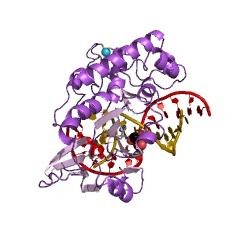 The MutM [formamidopyrimidine DNA glycosylase (Fpg)] protein is atrifunctional DNA base excision repair enzyme that removes a wide range ofoxidatively damaged bases (N-glycosylase activity) and cleaves both the3'- and 5'-phosphodiester bonds of the resulting apurinic/apyrimidinicsite (AP lyase activity). The crystal structure of MutM from an extremethermophile, Thermus thermophilus HB8, was determined at 1.9 A resolutionwith multiwavelength anomalous diffraction phasing using the intrinsicZn(2+) ion of the zinc finger. 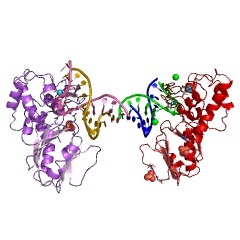 MutM is composed of two distinct and noveldomains connected by a flexible hinge. There is a large, electrostaticallypositive cleft lined by highly conserved residues between the domains. 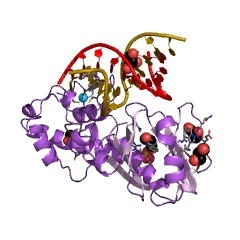 Onthe basis of the three-dimensional structure and taking account ofprevious biochemical experiments, we propose a DNA-binding mode andreaction mechanism for MutM. The locations of the putative catalyticresidues and the two DNA-binding motifs (the zinc finger and thehelix-two-turns-helix motifs) suggest that the oxidized base is flippedout from double-stranded DNA in the binding mode and excised by acatalytic mechanism similar to that of bifunctional base excision repairenzymes. 1kfv Crystal Structure of Lactococcus lactis Formamido-pyrimidine DNA Glycosylase (alias Fpg or MutM) Non Covalently Bound to an AP Site Containing DNA. 1pjj Complex between the Lactococcus lactis Fpg and an abasic site containing DNA. 1q39 Crystal structure of the DNA repair enzyme endonuclease-VIII (Nei) from E. coli: The WT enzyme at 2.8 resolution. 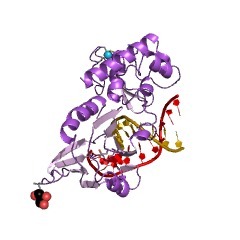 1q3b Crystal structure of the DNA repair enzyme endonuclease-VIII (Nei) from E. coli: The R252A mutant at 2.05 resolution. 1q3c Crystal structure of the DNA repair enzyme endonuclease-VIII (Nei) from E. coli: The E2A mutant at 2.3 resolution.